Carmeltazite: Mineral information, data and localities. The name carmeltazite derives from the type locality, Mt Carmel (“CARMEL”), and from the dominant metals present in the mineral, i.e., titanium, aluminum and zirconium (“TAZ”). Has an atomic arrangement similar to that observed in a defective spinel structure. Found in pockets of trapped melt interstitial to, or included in, corundum crystals. Represents a rather narrow group of minerals in which Zr and Ti are located in separate structural sites. Graph shows reflectance levels at different wavelengths (in nm). Top of box is 100%. Peak reflectance is 22.9%. Inclusions in pockets of trapped melt interstitial to, or included in, corundum xenocrysts. 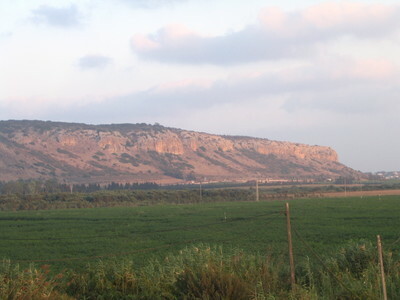 Cretaceous Mt Carmel volcanics of northern Israel. Griffin, W.L., Gain, S.E.M., Bindi, L., Toledo, V., Cámara, F., Saunders, M., O’Reilly, S.Y. (2018) Carmeltazite, ZrAl2Ti4O11, a New Mineral Trapped in Corundum from Volcanic Rocks of Mt Carmel, Northern Israel. Minerals: 8: 601. Griffin, W.L., Gain, S.E.M., Bindi, L., Toledo, V., Cámara, F., Saunders, M. and O’Reilly, S.Y. (2019) Carmeltazite, IMA 2018-103. CNMNC Newsletter No. 47, February 2019, page 201; European Journal of Mineralogy, 31: 199–204. Griffin, W.L., Gain, S.E.M., Bindi, L., Toledo, V., Cámara, F., Saunders, M., O’Reilly, S.Y. 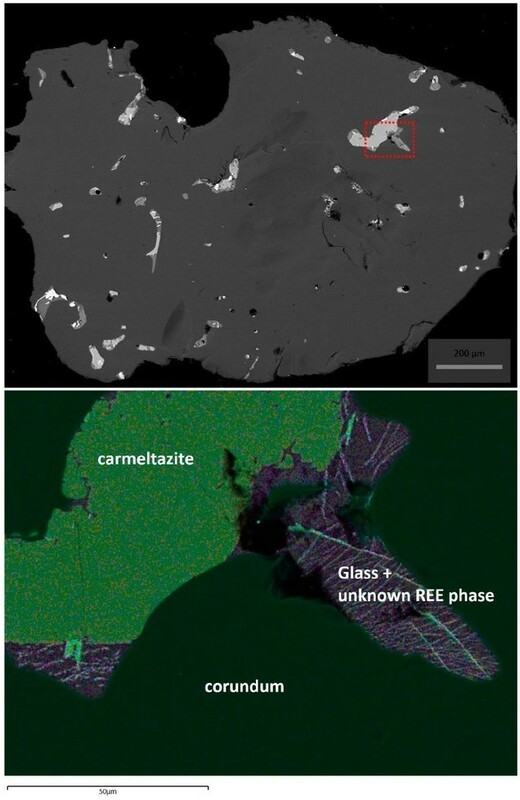 (2018): Carmeltazite, ZrAl2Ti4O11, a New Mineral Trapped in Corundum from Volcanic Rocks of Mt Carmel, Northern Israel. Minerals, 8, 601.